Background materials on the arrest and disappearance of three Timorese students in Jakarta. Includes McIntosh correspondence, Senate statements and questions. 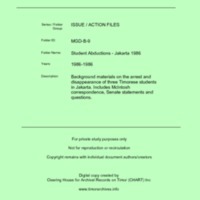 “Student Abductions - Jakarta 1986 [MGD B9],” CHART DIGITAL, accessed April 18, 2019, http://chart-digital.info/items/show/636.